If you wear this lovely pink topaz and diamond pendant, then you deserve to take a bow for your fine taste in jewelry. The Heart-Shape 8 mm Pink Topaz and Diamond Pendant in 10K White Gold is a beautiful example of how a creative design and luxurious gemstone can work together to extraordinary effect. The heart-shaped stone and solid gold frame create a sense of tried and true elegance. This pendant features round-cut white diamonds (0.08 t.c.w.) set in 10K white gold that is cast into the lovely image of a heart. Within the gold heart sits the topaz gemstone (8 x 8 mm, 2.25 ct.), exuding a candy-pink color that immediately draws in the eyes. Why not add this adorable pink topaz and white diamond pendant to your collection. It will certainly make you smile every time you wear it and look down to see its delicious color. Pendant comes with an 18 inch chain. 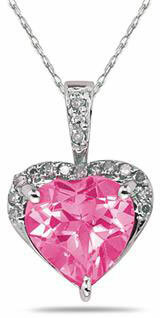 We guarantee our Heart-Shape 8mm Pink Topaz & Diamond Pendant 10K White Gold to be high quality, authentic jewelry, as described above.